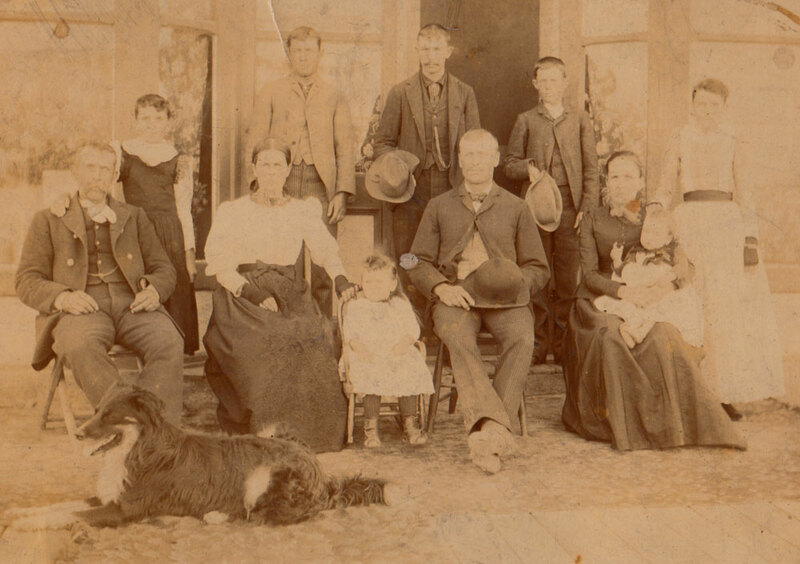 Sarah Jane Claybourn (known to the family as “Sally”) was born on 27 July 1841 near Shawneetown, Illinois, where her parents lived for a while before moving to Jefferson County, Illinois. As a young woman she taught a “Subscription School,” which provided a way for the pioneers to educate their children, since there were no public monies available to provide for education at that time. When there were enough pupils interested for the subscription school to be viable a teacher would be sought out and “subscriptions” or tuition payments were expected for each pupil. Just before turning twenty-six she married on 4 July 1869 to Jasper Newton (“Newt”) Hawkins (born on 4 June 1843). Newt had enlisted in Company F of the 40th Illinois Volunteer Infantry Regiment on 10 August 1861 as a corporal. He was listed as five feet, ten inches tall, with dark hair, blue eyes, light complexion, and a single farmer. At some point his term ended but he then re-enlisted as a veteran on 30 January 1864 before being discharged on 25 January 1865 due to wounds. He put in a claim as an invalid on 7 February 1865. The two lived about a mile from Dix, Illinois. Sally and Newt would often visit Sally’s father, William Divine Claybourn, by wagon, with chairs in the back of the wagon. Sally’s niece, Norah, recalled visiting Newt and Sally for week-long intervals, returning home when Newt and Sally would visit William on Sundays. She also recalled that “Aunt Sally” baked a large tiered cake for a birthday celebration for her father, using a tin cup to bake the last little top layer. 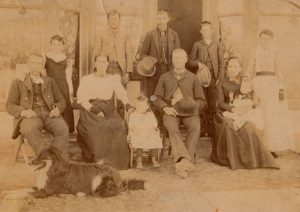 In about 1884, Sally and Newt moved overland in covered wagons with seven other families to Kansas, settling in Rice County, near Raymond. Norah visited there for eight weeks in 1905, following a nervous breakdown brought about for unknown reasons. Harriette Threlkeld reports that Sally took such good care of Norah and she was so much improved that she decided to go on to Oklahoma City and marry her fiance, Mr. Heiserman, instead of returning to Illinois. Norah described Sally as a wonderful woman and one of the best she ever knew. Together Sally and Newt had seven children, listed below. [The bulk of information about Sally and Newt’s children has been provided or confirmed by Jan Hawkins Biller, who corresponded with Joshua A. Claybourn in the summer of 2010.] Sally died on 27 January 1913 and Newt followed on 16 September 1924. Both Jasper and Sally are buried in Hilltop Cemetery in Raymond, Kansas. Newt and Sally are pictured here, seated, with the following behind them: Harry, Otto (Buck), Ira, Ina, Ala, and Elsie. Pictured seated: J. Newton Hawkins, Sarah C. Hawkins, an unknown girl, Aaron and Ina Herbold with daugher Barbara. Pictured standing: Alla, Ira, Otto, Harry and an unknown girl. Ina Hawkins Herbold (click name for full biography) was born on 19 July 1868 in Salem, Illinois and died on 13 November 1946 in Great Bend, Kansas. Ira Hawkins (click name for full biography) was born on 29 October 1869 in Dix, Illinois, and died 24 March 1943 in Jetmore, Hodgeman, Kansas. Iva Hawkins was born on 8 October 1871 in Illinois and died shortly thereafter on 8 April 1872 in Jefferson County, Illinois. She is buried there at Antioch Cemetery. Otto “Buck” Hawkins was born on 27 August 1873 in Jefferson County, Illinois. He married Minnie Rogers (b. 28 May 1878) on 16 October 1900. The two lived in Kansas and Colorado. Otto died on 24 June 1944 and his wife Minnie followed in April of 1977, both in Pueblo, Colorado. Merle Clifford Hawkins was born on 22 July 1901 in Kansas City, Kansas. He mar-ried Dovie Ethel Farris (1904-1991) on 14 March 1925 and they divorced in about 1942. Merle enlisted in the U.S. Army on 16 November 1942 stating he was di-vorced with dependents and served as a private in World War II. After the war, he and Dovie were both living in Pueblo at different addresses. In city directories, he is listed as an auto mechanic. Merle died on 29 October 1975 in Pueblo County, Colorado, and is buried in Mountain View Cemetery. Dennis Eldro Hawkins was born on 30 March 1927 in Pueblo County, Colorado. He served in the U.S. Navy during World War II. He is listed in the 1950 Pueblo city directory as single, and in the 1952 directory with a wife named Josephine. Dennis died on 14 March 2005 in Colorado Springs, Colorado and is buried in Denver at the Fort Logan National Cemetery. His headstone indicates he was a father. Curtis LeRoy Hawkins was born on 28 August 1930. Ralph Richard Hawkins was born on 30 September 1906 in Meade Co., Kansas. In about 1936 he married first to a woman named Ruth (born in about 1919 in Oregon). They had a son, Eugene Hawkins, born in about 1937 in Pueblo County, Colorado. On 20 June 1952 he married Christine Josette Trudell, a Native American of the Rosebud Sioux tribe previously married to Mr. Vaughn. [Christine Trudell was born on 1 April 1904 in Knox County, Nebraska.] Christine died on 13 July 1985 and Ralph followed on 25 July 1990, both in Pueblo, Colorado. They are buried together there in Mountain View Cemetery. Ala Hawkins was born on 20 November 1875 in Illinois. On 18 February 1894 she married Hollice Fay Heminger. [Hollice Heminger was born on 27 August 1873 in Ohio.] The two lived in Garden City, Kansas, and Oklahoma City. Hollice died in 1943 and Ala Hawkins Heminger died in 1952, probably in Oklahoma City. They are buried there in Memorial Park Cemetery. Orla Fae Heminger was born on 8 October 1896. On 8 October 1914 she married Delbert Hawk. [Delbert Hawk was born on 14 May 1895 in Reno County, Kansas.] He died on 26 February 1966 and Orla followed on 21 July 1967, both in Oklahoma City. They are both buried there in Memorial Park Cemetery. Hollice (“Holly”) Michael Hawk was born on 15 June 1915 in Hutchinson, Kansas. Holly graduated from Classen High School in 1933 and attended Oklahoma A&M (OSU). On 16 August 1936 Holly married (1st) Rossetta Mae Cross. [Rossetta Cross was born on 31 March 1916.] They were married 49 years until her passing and had three children together: Janice C. Hawk, Phillip Michael Hawk, and Thomas Steven Hawk. [Janice Hawk was born in 1938. Phillip Hawk was born on 14 June 1939. Thomas Hawk was born on 30 August 1944.] Following Rossetta’s death, Holly married (2nd) Marie Alta McCollum, widow of T. D. Peel (1909-1972), on 25 October 1986 in Oklahoma City. Holly retired from Cains Coffee in 1979 and was named Salesman of the Year on two occasions by the Oklahoma City Chamber of Commerce. He was also an active member of the First Christian Church of OKC for more than 35 years, where he served as a deacon, then as an elder. He later attended Grace United Methodist Church. He coached OKC YMCA little league baseball teams from 1949-1956 and was an avid golfer, scoring two holes-in-one over a lifetime of play and shooting his age well into his 80s. Holly passed away on 3 September 2010 and is buried at Memorial Park Cemetery in Oklahoma City. Ernest Delbert Hawk was born on 10 December 1917 in St. Joseph, Buchanan County, Missouri. On 22 June 1940 he married Ruby Faye Herring and together they had one son, Kerry Leonard Hawk. [Ruby Herring was born on 24 October 1918. Kerry Hawk was born on 21 November 1944.] Ernest served in the U.S Navy. Ruby died on 8 July 2002 and Ernest followed on 15 January 2003 in Oklahoma City. They are both buried there in Rose Hill Burial Park Cemetery. Leonard Fae Hawk was born on 17 May 1921 in Oklahoma City. He married on 20 November 1945 to Mary Alice Brock (1923-1999) and they had two children together, Michael Ray Hawk and Marilyn Kay Hawk. [Michael Hawk was born on 12 January 1947 and Marilyn Hawk was born on 6 May 1950.] Leonard was one of the first to fly a jet plane, but he died tragically on 20 July 1950 in a plane crash. He is buried in Memorial Park Cemetery in Oklahoma City. Harry Hawkins (click name for full biography) was born on 4 October 1877 in Illinois. He married Cassie Maud Shippler on 12 November 1902 in Raymond, Rice, Kansas. Elsie Hawkins was born on 6 January 1880 in Jefferson County, Illinois. On 22 June 1902 she married John Jackson Williamson [John Williamson was born in February of 1877 in Missouri.] and the two lived at Sugar City, Colorado and in Kansas. John died in 1947 and Elsie died in 1956. They are buried in Hilltop Cemetery in Raymond, Kansas. Glenice Alta Williamson was born on 6 December 1903 in Raymond, Kansas. On 30 October 1922 she married William Hubert Miller. [Glenice Williamson was born on 9 March 1901 in Illinois.] Glenice died in 1965 and William followed on 24 September 1982. They are buried in Arkansas City, Kansas. Together they had three children, listed below, the first two of which were twins. Fred (“Freddie”) LaVerne Miller was born on 20 May 1924 in Coffeyville, Montgomery County, Kansas. On 5 October 1950 he married Patricia Ellen Myers (1931-1994). [Patricia Myers was born 2 March 1931 in San Miguel County, New Mexico.] 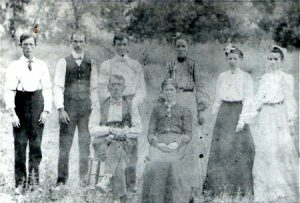 Together they had six children: James Randolph Miller, Glenda Gail Miller, Diane Miller, Fred Miller, Linda Miller, and Mitch Miller. [James Randolph Miller was born on 22 June 1951 in Montgomery Co., Kansas. He married Paula Jayne Mayfield on 24 June 1973 in Sacramento Co., California. They had at least one daughter. James died on 22 September 2008. Glenda Gail Miller was born on 18 December 1956 in Montgomery Co., Kansas. Glenda died on 16 August 2000 in Eugene, Oregon.] Freddie was a Technical Sergeant in the U.S. Air Force in World War II and Vietnam and was awarded a Purple Heart Medal. Fred died on 28 February 1992 and Patricia followed in death on 25 July 1994, both in North Highlands, California. They are buried there in Sylvan Cemetery. Fredia Maxine Miller (a twin) was born on 20 May 1924 in Coffeyville, Montgomery County, Kansas. In about 1943 she married Leonard Jerome Duchan (1920-1996), a staff sergeant in the U.S. Army Air Corps during World War II. They had one son, Gerald Lynn Duchan (1944-1994), who was a private in the U.S. Army from July 1962 to May 1965 serving in Vietnam. Fredia died on 24 November 2000 in Mendocino County, California. William Hubert Miller, Jr. was born on 22 July 1925 in Colorado. Rena Mae Williamson was born on 14 September 1906 in Kansas. On 8 December 1927 she married John J. Rosenkranz. [John Rosenkranz was born on 11 November 1898 in Germany and died on 9 October 1944 in San Francisco, California. ] The couple had lived in Pueblo Co., Colorado, but divorced between 1932 and 1939. In the 1940 census, Rena used her maiden name again, living in Los Angeles and indicating she lived in Los Angeles in 1935. At some point after the 1940 census and before her death she married a Mr. Catlett, which was her married name at death. She died on 22 June 1945 in Los Angeles. There was an unnamed infant Williamson who was born and died in 1908 in Raymond, Kansas. This infant is buried with the next child, Neyman. Neyman Orville Williamson was born on 26 April 1910 in Kansas, and died just a few months later on 5 July 1910. He was buried in Hilltop Cemetery in Rice County, Kansas. Norman Edward Williamson was born on 23 August 1911 in Kansas. On 19 October 1929 he married (1st) Zelma Lorena Holshousen. [Zelma Holshousen was born on 20 October 1909 in Union Co., Illinois and died on 22 November 1991 in Carney, Montgomery Co., Kansas.] After having two children together, listed below, they divorced in about 1937. Norman married (2nd) Annie Elizabeth Joseph in 1938 in Emery Co, Utah. [Annie Joseph was born on 29 March 1919 in Salt Lake City, Utah and died on 9 April 2001 in Salt Lake City.] They had at least one child, Norma, listed below. Norman was inducted into the U.S. Navy on 20 May 1944. He died on 6 September 1982 in Salt Lake City, Utah. Joyce Eileen Williamson was born on 14 November 1930 in Coffeyville, Kansas to Norman and Zelma. On 10 April 1955 she married Roy Hubert (“Bud”) Teehee. Joyce died on 27 November 2001 in Oklahoma City and she is buried there in Resurrection Memorial Cemetery. John Edward Williamson was born on 1 May 1934 in Coffeyville, Montgomery County, Kansas. He served in the U.S. Air Force from July 1952 to July 1978. He died on 29 December 1996 in Crestview, Okaloosa County, Florida, and is buried there in Pyron Chapel Cemetery. Norma Ann Williamson was bornin 1940 in Helper, Utah to Norman and Annie. Hazel Faye Williamson was born on 14 July 1913 in Raymond, Kansas. On 16 June 1929 she married James Rolf Ross. [James Ross was born on 2 February 1906 in Kentucky.] From 1930 through 1940 they were living in Rocky Ford, Colorado, which is where their children were born. Hazel died on 16 August 1988 and James died in October of 1978, both in Durango, Colorado. Robert Eugene Ross was born on 26 September 1930 and died less than a year later on 5 March 1931. Deloris Jean Ross was born on 28 April 1932 and died on 12 June 2014 in Colorado. The abstract of her obituary indicates she had several daughters: Jae Paulson, of Durango; Julia Gass; Sandra Jameson of Durango, Julia Gass of Aztec, Faye McGregor of South Fork and Cynthia Seckman of Estes Park. Norman Lee Ross was born on 10 August 1934 in Otero County, Colorado. He married JoAnn Betsy Yandell and they had one daughter. Norman died on 15 November 1981 in Durango, Colorado. Charlie was born in about 1936. Reah Belle Williamson was born on 2 July 1915 in Raymond, Kansas. In about 1933 she married (1st) George B. McEvoy. [George McEvoy was born on 3 June 1913 in Parker, Kansas and died on 8 April 1997 in Sun City West, Arizona.] Together they had two children, listed below. Reah and George divorced between 1955 and 1959. In 1959 she married (2nd) a Mr. Showalter. Reah died in March of 1996 in Salt Lake City and is buried in Resthave Gardens of Memory Cemetery in Sedgwick County, Kansas. George B. McEvoy was born on 27 June 1935 in Coffeyville, Kansas to Reah and George. Lester L. McEvoy was born on 1 July 1937 in Coffeyville, Kansas to Reah and George. He died on 23 June 1997. Libbie Deloris Williamson was born on 27 March 1917 in Raymond, Kansas. On 3 July 1935 she married Donald H. Eccles and they had one child together, listed below. [Donald Eccles was born on 29 August 1911 in Colorado.] Donald died on 24 November 1975 and Libbie followed in death on 30 September 2006. They are buried together in Hillcrest Cemetery in Otero County, Colorado. Derre Dean Eccles was born on 28 September 1937 in Otero County, Colorado. He served in the U.S. Air Force from 11 May 1959 to 10 February 1964. Derre died on 1 April 2005 in Colorado Springs and is buried in Hillcrest Cemetery in Otero County, Colorado.